These jam butter cookies with their red center are just the perfect pairing for the festive season. Just beware, they are so delicious that your little ones will be asking for them year round! At home, we bake these yummy cookies several times a year and they are gone in a snap. For Christmas, I make 3 portions of the jam butter cookies recipe to make sure that there is enough left for the guests! 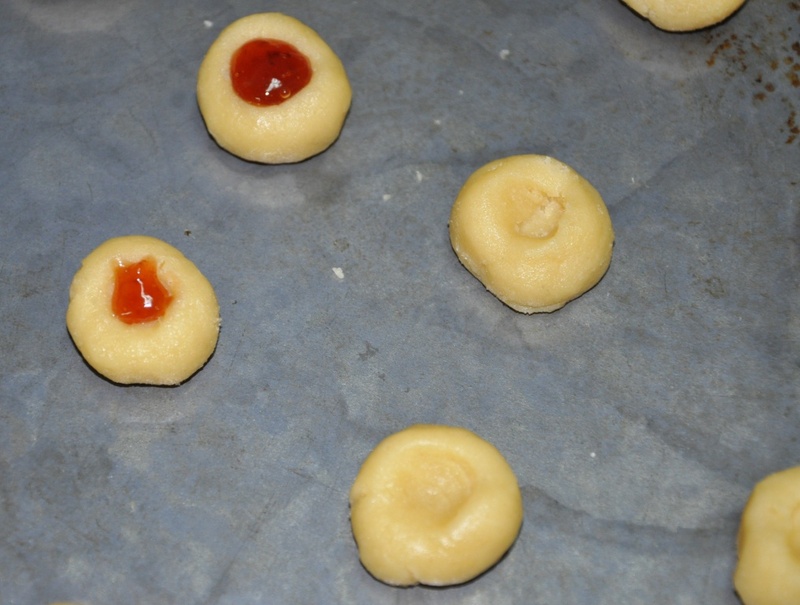 The good news is that these cookies are easy to make and kids like to participate in the fun of rolling and filling the centers with jam. I love these Jam Butter Cookies!!! Cream the butter, sugar, eggs and vanilla; then add the baking powder. Change the whisk hook on the mixer to the dough hook. Add the flour a bit at a time until a soft dough forms. Refrigerate for 1/2 an hour. Actually you can prepare the dough and refrigerate it up to 2 days in advance. Form small balls (2 centimeter diameter). Place balls on a baking sheet 3 centimeter away from each other. As the cookies contain a lot of butter you don't need to heavily grease the cookie sheet, just use a very small amount of oil on a tissue paper and wipe the bottom of the pan with it. As you finish each cookie pan sheet, place it in the freezer for a few minutes as you are working on the batch for the second pan sheet. Remove the pan from the freezer and make a well in the center on each cookie. I use the handle of a wooden spoon for that. I dust the handle with flour and press on the cookie ball - just be careful not to pierce the cookie. Fill the center with jam. Bake in preheated oven (375°) until golden brown on the bottom, be careful not to overcook. Usually when you remove cookies from the oven they are still soft and harden as they cool. 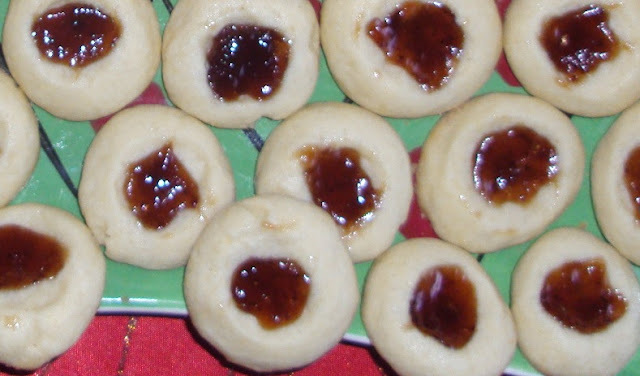 Hope you enjoyed today's easy sweet recipe: Jam Butter Cookies. Bon appetite! Check my Ginger cut-out Cookies with a Middle Eastern Twist and my Butter Cookies. Both are great Christmas treats! Seta, these cookies look so delicious! Am gonna try them I will comment later! !